Do you LOVE to make art? Fall is the perfect time of year to cozy up indoors and make something beautiful. There are a TON of arts and crafts classes in and around Boulder, offered by amazing, talented teachers. Learn how to make ceramics on a potter’s wheel, make jewelry, try your hand at metalsmithing and so much more! Create four simple and fun Halloween cards & one spooky sweet treat box at the Spooky Sweets Card Class hosted by The Hidden Treasure 2 and My Stampin Memories. Envelopes are included so your cards will be ready to send when you return home. This class is great for beginners and kid-friendly for children 10 years & older. The Hidden Treasure 2 in Longmont offers the Spooky Sweets Card Class on October 13, 2018, from 11 AM – 1 PM. The cost of the class is $20. To register, call the shop at 720-340-9951. Nomad Bead Merchants offers a variety of jewelry-making classes. Upcoming, check out their Dancing Skeleton Earrings class! These happy little skeletons can be made in a variety of colors – white, no surprise, is very popular – and will work up quickly with an assortment of seed beads, bugles, and tiny skulls. Have a little fun with this seasonally appropriate design. Nomad Bead Merchants offers a variety of jewelry making classes regularly, check their calendar here. Nomad Bead Merchants is offering the Dancing Skeleton Earrings class in Boulder on Sunday, October 14, 2018 from 1 PM – 4 PM. Tuition for the class is $45 (materials will be provided). Call the store at 303-786-9746 to register for this class. Color Me Mine is teaming up with Museum of Boulder to host a Pumpkin Palooza Painting Party. Several varieties of ceramic pumpkins will be available to choose from… like a real pumpkin patch! Cost includes ceramic, plus all supplies, paints, glazing, and firing. 25% of all profits go back to the museum. Kid friendly. The Pumpkin Palooza Painting Party will be held at Museum of Boulder on October 20, 2018 from 1 PM – 4 PM. Price will range based on pumpkin size ($25-$45). Whether you want to be Mildred from The Worst Witch, Professor McGonagall, or the Wicked Witch of the West, a witch hat is the perfect Halloween accessory! Fabricate is offering a class to create this fun felt hat. The hat can be made in different sizes and is a suitable project for children 8 and up. Embellish your hat to make each a unique creation! Can be taken as an adult or Mom and Me class. Bring a 1/2 yard of felt and desired embellishments or buy at Fabricate for 15% off. Fabricate is offering the Halloween Witch Hat in Boulder on Saturday, October 20, from 12:30 PM – 2:30 PM. Tuition for the class is $40 not including materials (Fabricate will give you a 15% discount for materials purchased in-store). Register here. Soldering, hammering and polishing? Sounds like fun! Check out Boulder School of Metal‘s 6 week course Intro to Metalsmithing to develop a wide range of fundamental jewelry-making skills that are essential for building a solid foundation. You’ll be introduced to a wide variety of tools and techniques which include: proper use of hand tools, soldering torches, flexshafts, hammers, polishing equipment, jeweler’s saw, doming blocks and more. You will learn how to cut, solder, saw, pierce, dome, texture, drill etc. to create 1-3 pieces in this 6 week session. Boulder School of Metal‘s Intro to Metalsmithing is a 6-week session. This class runs Tuesdays from 10am – 1pm, October 23 – December 4, 2018 or Monday evenings from 6 PM – 9 PM October 29 – December 10, 2018. The course tuition is $335 + $60 fee for materials. Register here. Painting at PoshSplat is a great way to spend time and do something creative with the family, a friend, or with your child. Step by step instruction is provided by a local artist and everyone paints a picture that is uniquely theirs. On Thursday, October 25 the painting will be Falling for Fall. No experience, set up, or clean up necessary! Just come and enjoy an afternoon of fun, and create beautiful works of art for your home! PoshSplat’s Falling for Fall class will be held on Thursday, October 25, 2018 at 6:30 PM. $35/Person. Register here. Boulder has a Parks and Open Space system that is second to none, and the photographic opportunities are almost limitless throughout Boulder County. Boulder Photo Center schedules this Nature Hike Photo Class at this beautiful time of year when the leaves are changing. For more info, click here. Boulder Photo Center offers the Nature Hike Photo Class on Saturday, October 27, 2018 from 9 AM – 11AM. Tuition for the class is $35/person or $50/couple.To register, call Don Oberbeck at 303-444-4568. Learn how to make a detailed image using a felting needle at pARTicular’s Felt Painting Workshop. You will design your piece on a pre-felted wool square that can be turned into a beautiful wall hanging. Needle and wet felting techniques will be demonstrated for enhancing your piece. Each student will make their own wet-felted background piece to take home to use for a second felt painting. For more info, click here. pARTiculars Art Gallery & Teaching Studio in Lafayette is offering the Felt Paiting Workshop on Sunday, October 28, 2018 from 12 PM – 3 PM. Tuition for the class is $35. Register here. Always wanted to try making pottery? Sign up for this introductory class to get a taste of what is offered at the Boulder Pottery Lab. Each week students will make a project using a new piece of equipment or construction technique. The Lab provides all the clay and tools. You’ll leave with a few finished pieces and a basic familiarity with the potter’s studio. Great for first-time students. Week 1: Hand-building with slabs and pinch pots; Week 2: Wheel throwing; Week 3: Trimming wheel-thrown work from the previous class; Week 4: Hand-building with marbled clay coils and slabs; Week 5: Glazing & raku firing. For all the details, click here. The 5 Week Pottery Sampler runs from October 28 – November 25, 2018 from 5 PM – 7PM. This session costs $130. Register here. Tinker Art Studios will be leading a fun Friday night painting class in November, with Van Gogh Inspired Sunflowers. Inspired by the master, you will use a post-impressionistic style to create a vibrant and energetic painting. These Friday night workshops are fun and casual. BYOB! This class will be held on Friday, November 2, 2018 from 6 PM – 8:30 PM. $38/Person. Register here. What could be a more perfect project in the fall than knitting a warm pair of mittens? The knowledgeable instructors at Shuttles, Spindles and Skeins will teach you how to make three quick and easy, snug and warm mittens–three different ways–by felting, cables and slip stitch techniques. 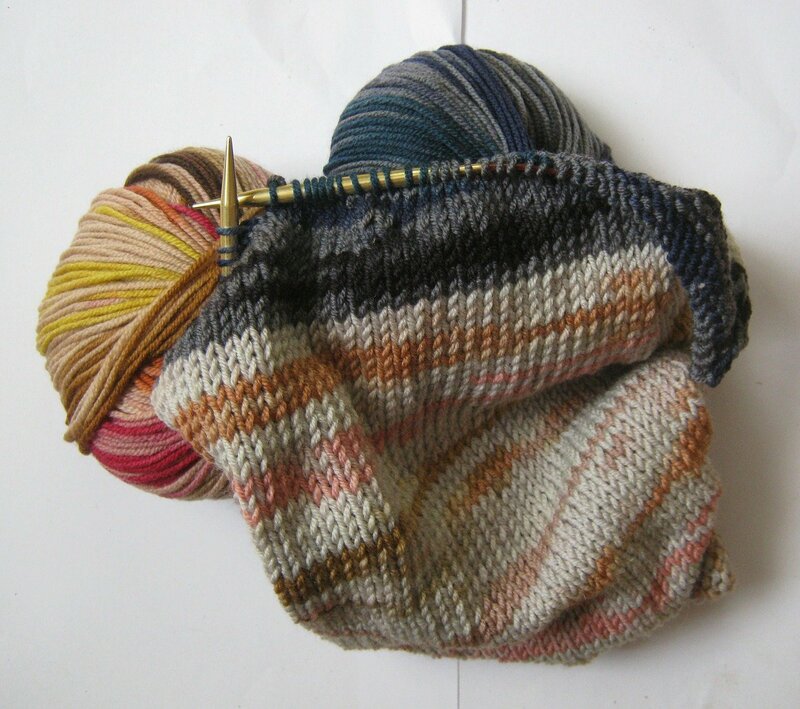 Beginning knitting skills required—no experience with double pointed needles required. Shuttles, Spindles and Skeins also is also offering classes on knitting socks, shawls and sweaters. For all class listings, click here. Shuttles, Spindles and Skeins is offering The Mitten Class in Boulder on Thursdays November 8 & 15, 2018 from 1 PM – 3:30 PM. Tuition is $50 and includes both sessions. Register here.